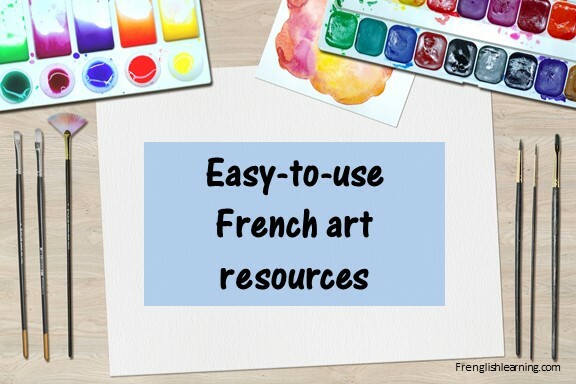 Hurray for French art resources! One of the ways that we incorporate more French into our week is by combining it with other subjects. Art is a fun one for this because it’s very hands-on, which is great for vocabulary retention. We did these activities in the spring, but they really work for any season. I am not the least bit artsy, but I enjoyed going through these books and coaching my kids through the projects. This post contains a selection of the French art resources that we used to for our study. For every item listed, there were about 5 others that didn’t make the cut for this post! 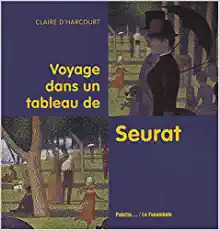 Note this French art resource book is consumable so you’ll need one for each child ($12.95 each at Librarie du Centre). The last time I checked, the price on Amazon Canada was over $30 for a used one. Crazy. Side note – Librarie du Centre will ship worldwide – here are their rates. I am not an affiliate for Librarie du Centre and they are not paying me to tell you about them. They are just a great store with a lot of selection and good service. 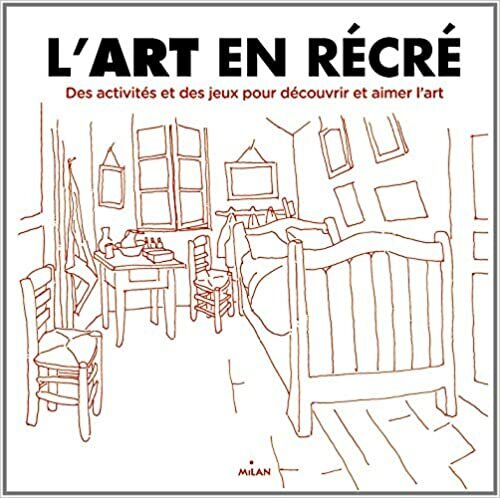 After we finished Fais parler les murs, we moved on to Art en récré and used this French art resource book as our spine. Each time we had a lesson, I would read about 10 pages aloud and then the kids would complete the activities from the book. The book is set up to be drawn/written in on specific pages. If you don’t want to buy multiple copies for your kids, it’s possible (although a bit fiddly) to do the activities on separate paper (so no copyright violation because you’re not photocopying). You don’t need any fancy materials for any of the activities. We all really enjoyed this book because it had a ton of pictures of paintings in it with little snippets of text underneath. The book is also set up to be very interactive, with questions and things to find in the paintings. If you speak French well enough to read it, I would highly recommend the book – it’s a great way to get the conversation going. If you can’t get it at your library, find it on Amazon here (Canada), here (US), or here (Librarie du Centre). I searched our local library catalog to find other French art resource books to go with what we were covering in Art en récré. We read books about art in general, specific artists, and places – like the Louvre in France and the city of Venice. A favourite French art resource series was Lampe Magique. These books come with a special “lamp” to see the pictures in the book. If you get them from the library and the lamp is missing, just use a piece of white paper. My kids were 9 and 10 years old when we used these books and they were still fighting over who got to “work the lamp” (eye roll). We used Les portraits d’Arcimboldo and Le musée du Louvre, but there are a whole bunch of other ones in the series. You can find a complete list here to get the titles and then request them from your library. 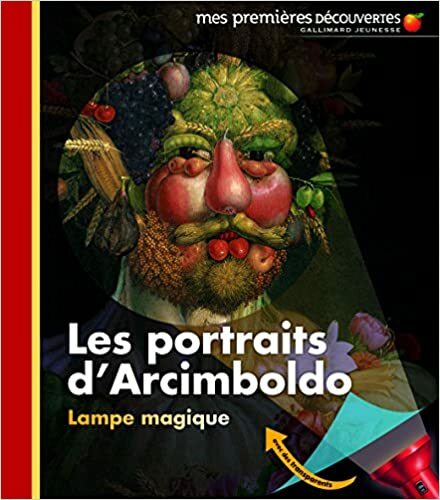 Or get Les Portraits d’Arcimboldo from Amazon here (Canada), or here (US), or from Libraririe du Centre. Le musée du Louvre: Amazon (Canada). 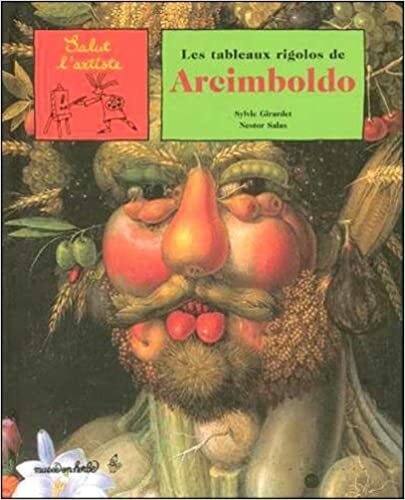 We used Les tableaux rigolos de Arcimboldo. It was a ton of fun. I liked it because it showed the picture of the painting, description, and also something for the kids to look for: A specific detail, match the right shadow to the face, or name the animals from the list that were not in the painting, that sort of thing. Enhanced observation skills and provided extra discussion opportunities. If it’s not at your library, get it on Amazon here (Canada), or here (US). 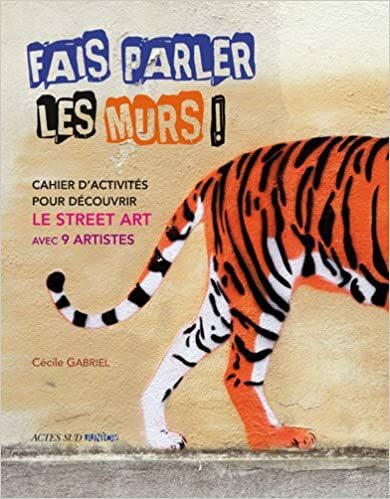 We used a few of the French art resource books from this series and they were great too. Each book shows a small detail of the painting with a short write-up on each page and then shows you the whole painting at the end. If your library doesn’t carry them, find them on Amazon here (Canada), or here (US). Librarie du Centre has them here. I must confess that most of the hands-on projects we did came from English books. We worked through book 1 of Artistic Pursuits and my kids liked it so much that we are continuing on with the other books. The Famous Artists online unit study from Techie Homeschool Mom has been a huge hit as well. What’s your favourite art resource? This entry was posted in 4-6 years, 7-10 years, Advanced, Bilingual parent, Books, Immersion, Intermediate, Other, Parent speaks some French by Leanne. Bookmark the permalink.